MagicQ software runs on PCs and Macs and can be downloaded free from the ChamSys web site www.chamsys.co.uk/download. MagicDMX devices do NOT need any additional drivers – they use HID drivers within the operating system. Simply plug in the device and start MagicQ. To confirm that the MagicDMX is operating correctly go to Setup, View System, View status, Interfaces. The MagicDMX Status should say "Connected" and "DMX out". MagicDMX is enabled as DMX output by default. It can be disable/enabled from Setup, View Setings, Ports, MagicDMX. When first plugged in the MagicDMX alternates green and orange LEDs every second. When MagicQ is started and connects to the device then the green LED is on permanently and the orange flashes faster as it receives data from MagicQ. When using MagicDMX Basic and MagicDMX Full interfaces demo mode will continue to be shown at the top of the MagicQ window. This does not affect the programming of MagicQ or restrict the output if you have a MagicDMX Full interface. Demo mode does restrict some advanced MagicQ functions which are unlocked with MagicQ hardware (Not MagicDMX). MagicQ Wings (Mini wing, PC Wing, Maxi Wing, Extra Wing, Playback Wing, Execute Wing) and MagicQ DMX interfaces (Dual DMX, Audio, MIDI/SMPTE) use a USB chipset made by FTDI which requires the installation of the correct drivers. Note that the drivers for MagicQ Wings and MagicQ DMX interfaces ARE NOT applicable to MagicDMX Basic or MagicDMX Full. Do not attempt to install drivers for MagicDMX. MagicQ supports Windows 7, Windows 8 and Windows 10. MagicDMX devices do not need any drivers - see Section 2.2, “MagicDMX”. C:\ProgramFiles\ChamSys Ltd\Magicq\MagicQ Wing Drivers. On 64 bit systems MagicQ is installed in Program Files (x86) instead of Program Files. Disconnect all MagicQ Wings and Interfaces except the one you are trying to install the driver for. Open Device Manager. This is found in different places depending on the version of Windows, but it can normally be accessed by opening Control Panel and then selecting System, and then selecting Device Manager. Device Manager lists all the devices on your system. The MagicQ device is normally listed at the bottom under Universal Serial Bus Controllers but it may be under any other section. It may be listed as a ChamSys or MagicQ device or just as a FTDI device. If you can not find it then try disconnecting and reconnecting the USB cable to the device - the listing should update and indicate to you which device is being plugged/unplugged. When you have identified the device then right click and press Update Driver. 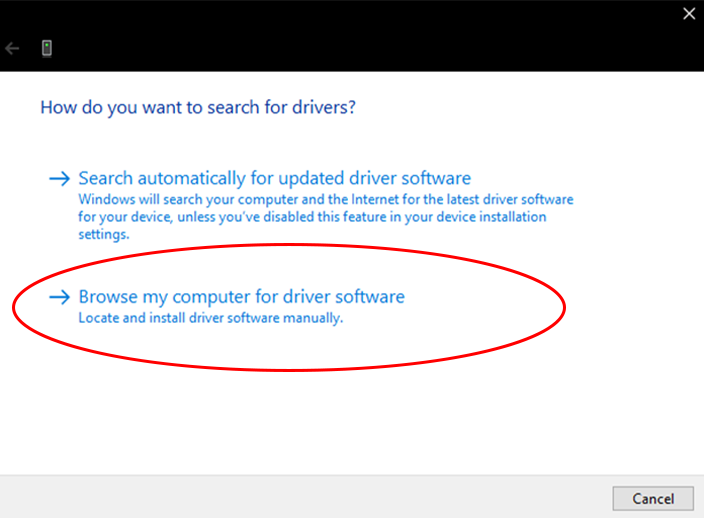 Select "Browse My Computer for Driver Software (Locate and Install Driver Software Manually)". Do not let Windows search for a driver. 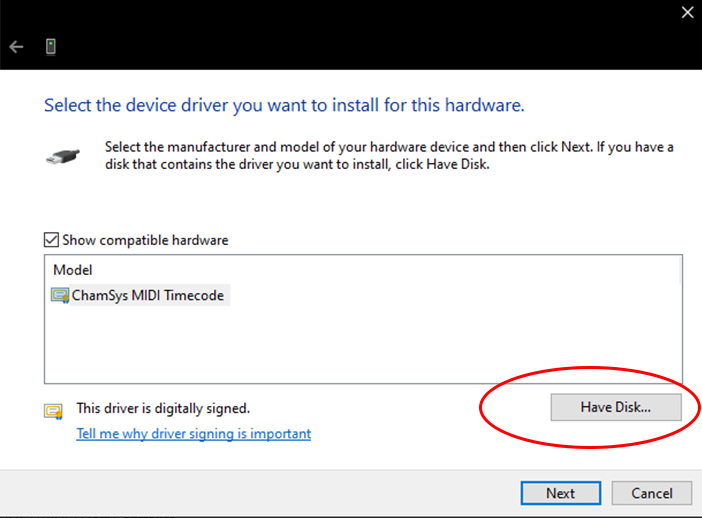 Select the option "Let me pick from a list of device drivers on my computer". Select "Have Disk". If you cannot find "Have Disk" then click on items in the list until you get it. PC Wing Compacts require MagicQ software version 1.5.8.0 or above. If the MagicQ USB wing periodically disconnects and restarts then check the Windows settings for your USB ports - Windows may be shutting down the USB ports when it incorrectly thinks they are idle. 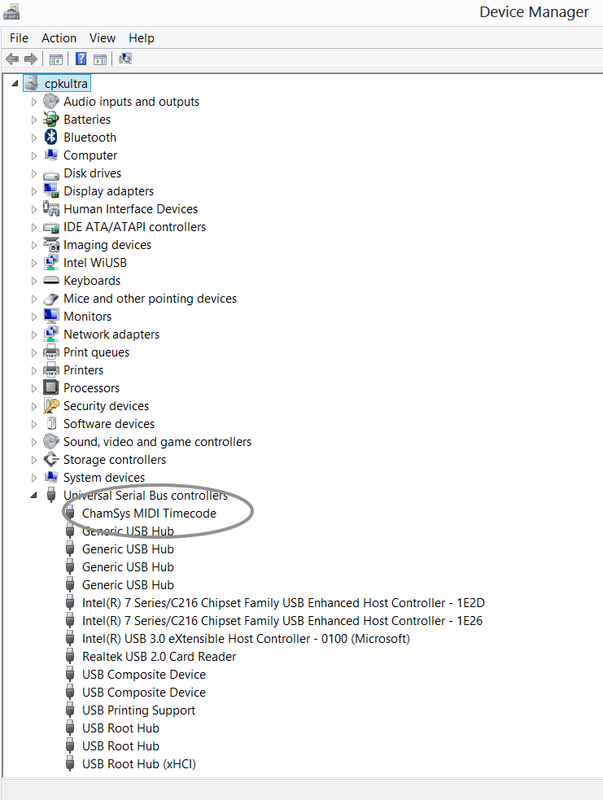 Click on Control Panel, System, Device Manager and scroll to the bottom to get a list of the USB devices. For each USB Root Hub click on Properties, Power Management and make sure that the option "Allow the computer to turn off this device to save power" is NOT selected. 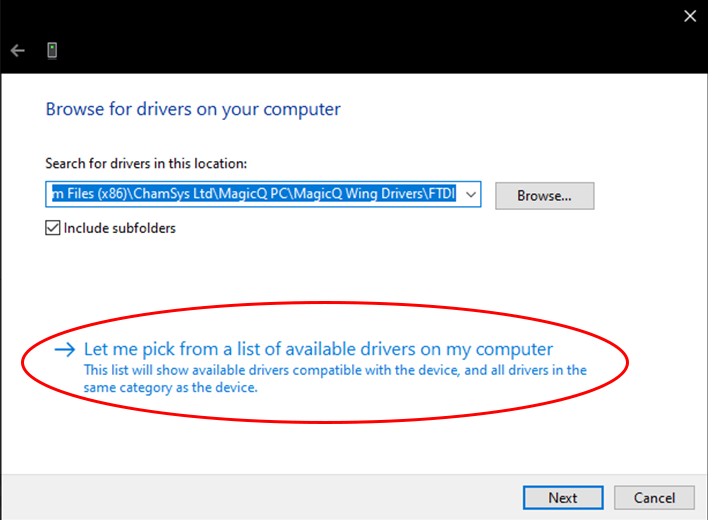 On some Windows systems the Update Drivers dialog will not show the driver files even though they are correctly in the MagicQ Wing Drivers folder. In this case try copying the whole MagicQ Wing Drivers folder to the desktop (using Windows Explorer) and then try to update the drivers again. 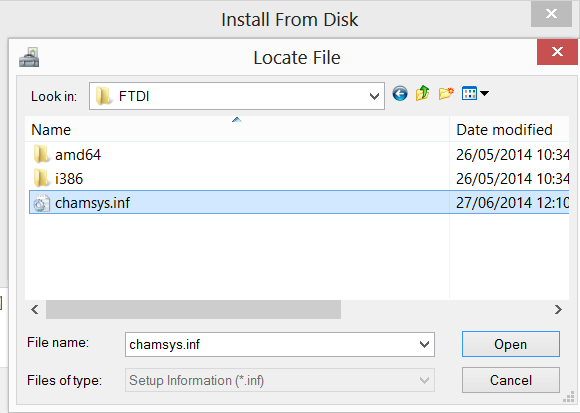 Note that Vista, Windows 7, 8 and 10 has User Authentication which may cause your show / head files to be stored in c:\users\username\AppData\Local\VirtualStore\Program Files\ChamSys Ltd\MagicQ PC\show instead of c:\Program Files\ChamSys Ltd\MagicQ PC\show. If MagicQ does not store settings after a restart - it forgets the number of universes, IP address or DMX I/O settings - then this is likely caused by Windows restricting write access to the folders where MagicQ stores this data. Check permissions and try to run MagicQ as administrator. To Run MagicQ as an administrator on Windows, right click on the MagicQ desktop icon and select run as administrator from the options menu. Windows controls the level of access to system folders through the User Account Control Settings. This can be found in Control Panel, User Accounts, Change User Account Control settings. 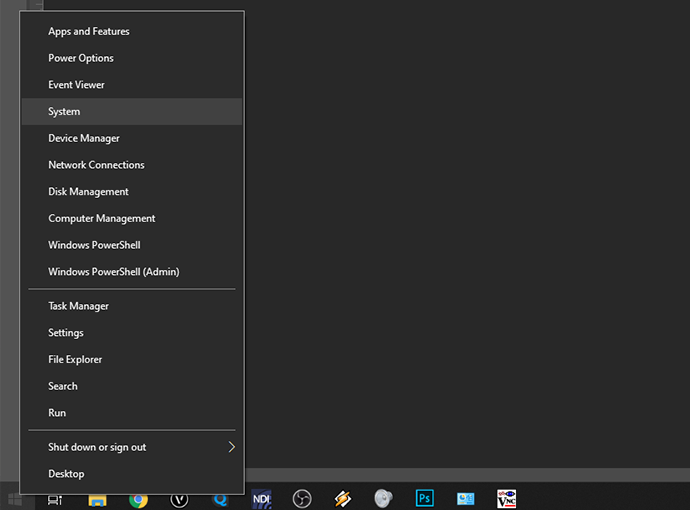 Setting this to "Never Notify" will make Windows less restrictive. Note that for security reasons this is only recommended for stand alone systems dedicated to MagicQ which are not connected to the internet - please make sure you understand the implications for your computer, before changing this setting. MagicQ Support macOS 10.11, 10.12 and 10.13.
macOS includes all the required drivers for MagicQ wings and interfaces and no action should be required to install them. MagicQ wings and interfaces must be powered up and connected to the Mac before MagicQ is started. In 10.11 El Capitan, Apple have forced the use of their Apple FTDI Driver rather than the manufacturer provided driver - the option to Disable the Apple FTDI Drivers in the MagicQ Tools Menu will not work as Apple have blocked it. In MagicQ version 1.7.0.2 we have modified MagicQ to enable MagicQ PC Wing Compact and MagicQ Extra Wing Compact to use the Apple inbuilt FTDI (VCP) Drivers. If you are only trying to connect a MagicQ PC Wing Compact or a MagicQ Extra Wing Compact, then check that the option Setup, View Settings, Ports, MagicQ Wings & Interfaces is set to "Yes, auto DMX". Due to problems with the Apple FTDI Driver, when MagicQ version 1.7.0.2 is run on OSX 10.11 then by default it does not have support enabled for older MagicQ Wings such as MagicQ Mini Wing, Maxi Wing, old PC Wing, old Extra Wing, Playback Wing, Extra Wing and 3rd party devices such as Enttec Pro. To use these interfaces with v1.7.0.2 on OSX 10.11, set the option Setup, View Settings, Ports, MagicQ Wings & Interfaces to "FTDI + VCP driver, auto DMX". When this option is enabled, MagicQ will take about a minute to start up and look for wings even if there are none present - during this time the system will be blocked. We are working with FTDI to try to find a work around to this problem. On all versions we recommend you disable Computer sleep and turn off App Nap to avoid MagicQ being shut down inadvertently. If you get the message "Cannot write file" when trying to save a show file, or your settings changes are not saved then check that the MagicQ folder and all its subfolders have both read and write permission. 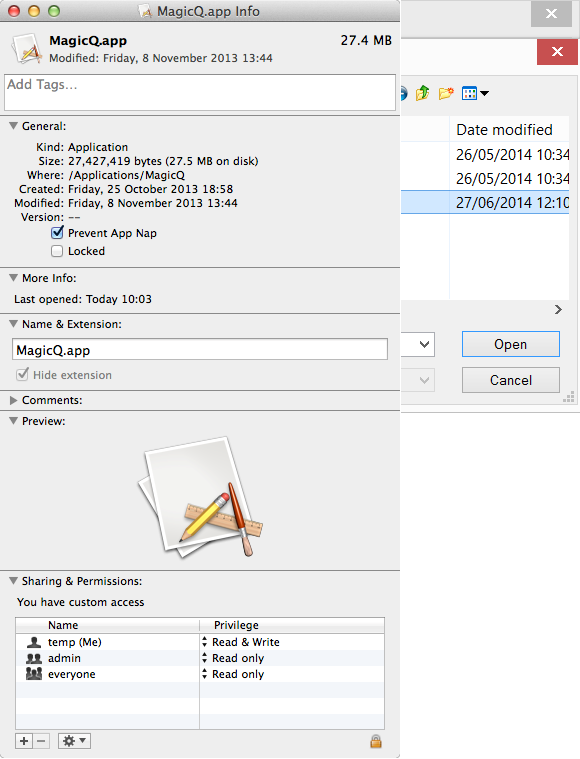 If you get a message starting with "MagicQ needs to write to the install folder…", you will need to check the permisions of the "MagicQ" folder. There are detailed steps in the troubleshooting chapter. MagicQ can be installed on Ubuntu 14.04, 16.04 and 18.04 64 bit. We cannot provide support for Linux specific issues; the best place to ask questions is on community forums and social media websites. 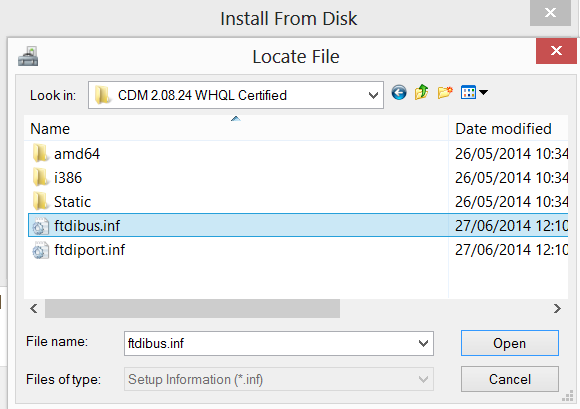 Using MagicQ wings and interfaces requires the ftdi_sio kernel driver which is included as standard on most Linux distributions. You can download MagicQ for Linux from the bugtracker. MagicQ for Linux is only available for 64 bit AMD/Intel systems. We no longer provide downloads for 32 bit Linux from version 1.8.0.3. MagicQ will not run on other architectures (e.g. ARM). Replacing the filename above the the name of the downloaded file. Automatic scaling for high resolution screens is disabled by default as with some screens it made the MagicQ user interface too big. From version 1.8.0.4 you can create a file called .magicq_init.sh in your home directory (/home/USERNAME/.magicq_init.sh) and make sure it has executeble permissions. See http://doc.qt.io/qt-5/highdpi.html for more information on the environment variables in this file.